Glacier is one of my favorite National Parks. My husband is a videographer. We have been to Glacier National Park the last three years in early summer, so we have hiked a few places. Iceberg Lake is one of my favorite Glacier National Park hiking trails. It’s just so beautiful. We saw a big herd of mountain goats, traversed snow chutes and were just really in awe of the beauty all around us. Our last trip to Glacier in June 2009, we took a helicopter flight over the park, it was awesome. I took this aerial photo of Iceberg Lake. You can see the trail on the lower right side of the photo. Boy does that bring back memories. A very well done video, thank you. I went snow blind on the way back from Ice Berg in ’67 with a group that I could not let know I was not seeing well. My horse the bronc that he was at least knw his way back to the corral. As long as we were in the timber I was able to make out the tree top against the sky and knew we were on the trail. Fortunatley we were late and my boss met us as we hit the open slopes above Swiftcurrent. So many memories. thank you again. After seeing your video, I am so excited to be visiting the park during the coming month (August 2011). Thank you for sharing your beautiful film! I will be there in July 2010 and have looked at quite a few traveler’s videos, but yours is award winning! Thank you. Thank you for the beautiful video……..a trip to this park definitely needs to be on my bucket list…….are those grizzlies???????? Join in and write your own page! It’s easy to do. How? Just click here! 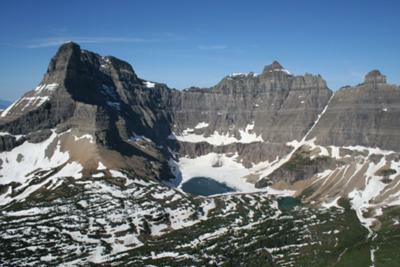 Simply click here to return to Your Favorite Glacier National Park Hikes. My husband rented a cottage in Many Glacier for my birthday. We hiked the Iceberg Lake Trail and then the Ptarmigan Tunnel Trail the next day. I got to see a grizzly bear for the 1st time. (Great birthday present) She was huge. We saw the momma grizzly with her 3 cubs along the side of the trail. It was a beautiful sight to see them. The momma grizzly was digging on log and then the cubs went over to it to check it out. It was hard to get their picture because they kept disappearing in the tall foliage and it was raining so my camera lense kept getting all wet. We also saw a bull moose, bull elk, & some mule deer. I am looking forward to next year in Glacier Park. I did use a zoom lense. We lost them in the tall foliage and when we saw them again they were getting way too close…. about 20 yards!!! So, we hiked on and left them. Bettter safe than sorry. But, there were a few other people on the trail that didn’t move away. Way to scarry for me. Although I live in the foothills of the Smoky Mountains, the trails in Glacier National Park rate high on my list of memorable hikes. During my years of working at Glacier Park Lodge it was hard to get more than one day off from work, so the Iceberg Lake trail was perfect for that one day off. The trail wasn’t too strenuous and the reward at the end was fabulous. The pristine lake with that special glacial blue color, loaded with floating ice with the Garden Wall as a backdrop is a sight that will never be forgotten. There was never a crowd and the trail was well maintained. I hope one day I can bring my family to enjoy the hike that I did when I spent my summers working in Glacier National Park. My husband & I hiked to Iceberg Lake in Aug 2010. It was beautiful to see the lake and the wildlife. How lucky you were to hike Iceberg Lake every week and hike it without crowds.